It was announced November 22nd that casting is finally complete for the much anticipated Manhattan Theatre Club production of Wit. 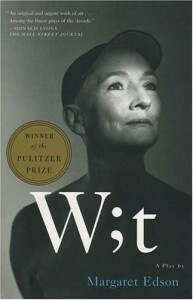 Wit was written by playwright Margaret Edson and first produced in New York in 1999. It was in this same year that the play won the Pulitzer Prize for Drama. Despite the play’s numerous awards it hasn’t been eligible for a Tony Award because it was never produced in a Broadway theater. This new production at the Samuel J. Friedman Theatre will be the first Broadway production of the masterpiece. The play will be starring Tony Award and Emmy Award winning actress Cynthia Nixon in the lead role of Vivian Bearing. Cynthia Nixon will be joined by a group of talented and established theater actors: Pun Bandhu (Technician), Suzanne Bertish (E.M. Ashford), Michael Country (Harvey Kelekian/Mr. Bearing), Jessica Dickey (Technician), Chike Johnson (Technician), Greg Kelley (Jason Posner), Carra Patterson (Sushi Monahan) and Zachary Spicer (Technician). Directed by Lynne Meadow, previews for Wit begin on January 5, 2012. A three month production, the play officially premieres on January 26 and tickets for performances will go through March 11. Wit is a beautiful story about a scholar who after dedicating her life to academia finds out she has Stage IV breast cancer. Dying with no friends or family Dr. Vivian Bearing, the protagonist, realizes that maybe she has spent her life pursuing the wrong things. Through the stages of her illness Dr. Vivian Bearing rediscovers her humanity. With an all-star cast and the prestigious Lynne Meadow directing, this Broadway production for Wit is sure to be exceptional.